Headlines From Around The World : Parallels The stories are from a cross section of news organizations around the world. Wednesday's stories range from a border defense agreement between India and China to curtailed mail delivery in New Zealand. Chinese Premier Li Keqiang talks during a joint news conference with India's Prime Minister Manmohan Singh at the Great Hall of the People in Beijing on Wednesday. We begin with an agreement between the world's most populous and second-most populous countries. 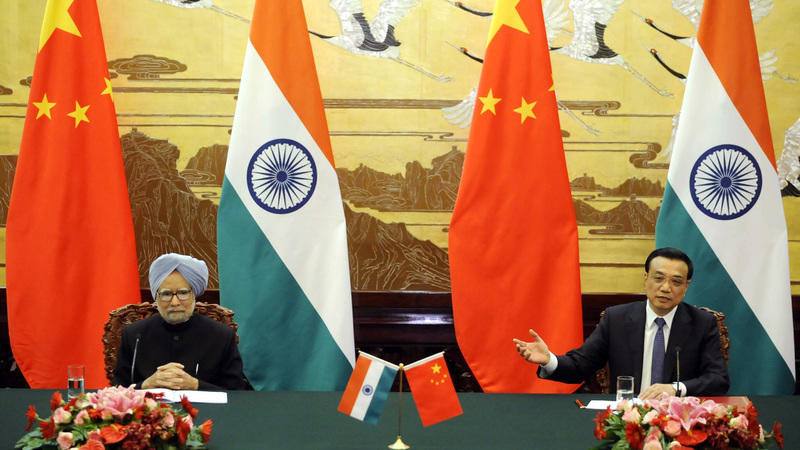 India and China signed an agreement in Beijing on Wednesday on border defense following a military standoff earlier this year in an area they both claim. "Addressing a press briefing together with visiting Indian Prime Minister Manmohan Singh after their meeting, Li said they both believe the two countries have more common interests than disagreements and the people and governments of the two countries have the ability to manage border disputes. "After the meeting, China and India signed a memorandum of understanding on strengthening cooperation on trans-border rivers, and they agreed to cooperate through an existing mechanism between experts in the two countries." India's semiofficial Press Trust of India quoted Singh as saying peace on the border must remain the foundation of ties between the two countries "even as we move forward the negotiations towards a fair, reasonable and mutually acceptable settlement to the India-China Boundary Question." The border dispute in several areas dates back to the 1962 war between the two countries. There have been occasional skirmishes along the border, most recently in April when India says Chinese soldiers intruded on its territory. Next, we go to China's dealings with Turkey. Turkish Prime Minister Recep Tayyip Erdogan is dismissing criticism from his NATO allies following Ankara's decision to buy a missile system from China. "Nobody has the right to overshadow our independence," he said Wednesday, in comments reported by Hurriyet Daily News. NATO chief Anders Fogh Rasmussen said Tuesday he hoped Turkey would take the alliance's view into account before making a final decision. "The Turkish government's decision to start negotiations with a Chinese firm for the co-production of the $3.4 billion missile defense system has triggered serious concerns from NATO and among member countries, particularly the United States. The fact that the Chinese company, China Precision Machinery Import and Export Corp's, is under U.S. sanctions also complicates the situation." Finally, a story about New Zealand's postal service — one that'll be familiar to those who've been watching the debate in the U.S. over Saturday delivery. The New Zealand Herald reports that the country's government has allowed NZ Post to move to a three-day-a-week schedule from 2015 "to ensure the postal service remains viable." "While parcel volumes had increased by nearly 3 million since 2006, over the same period letter volumes dropped by 322 million — or 30 percent," the newspaper reported. The Engineering, Printing and Manufacturing Union, a union representing some postal workers, said it was "incredibly disappointed with this decision, and how it has been made."